Earl's EZ-Beader, internal tubing bead roller, provides a secure attachment point for rubber hose on rigid aluminum tubing. 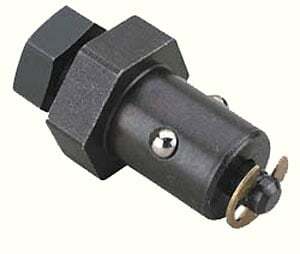 This tool is compact enough to be used on installed tubing. It produces a properly positioned, perfectly radiused bead on the end of aluminum tubing (wall thicknesses from .035" to .065") for a simple solution to a serious safety issue. No mechanic should be without an EZ-Beader! 008 is rated 3.3 out of 5 by 3. Rated 5 out of 5 by Scamp from Just Right! This tubing beader is designed for the user who might use it a few times a month. I bought it because the project I am working on required a bead to be placed on four pieces of soft aluminum tubing. Compared to the overpriced $400.00 commercial/professional beader it is but a toy. BUT, if you lube it well and proceed slowly, adjust the spreader a just part of a turn for every three or four revolutions of the main body, you get a well formed and professional looking bead. Be certain to clean all the lube from the inside of the tube when the bead is completed. Rated 3 out of 5 by Bill Brasky from Does the job... Barely Used this to bead some aluminum fuel lines. You have to make sure to oil it well and go very slowly. I'd pretty much recommending not even using wrenches... Just do it by hand. Jammed when I tried to go too fast and I had to take it all apart and clean the metal shavings out of it. Just turn the inside screw a bit and then turn the outside till it's easy. Repeat until the inner screw is all the way in. Did I mention it didn't come with any instructions? After all that, the resulting "bead" is only like 1mm tall. Did I mention it didn't come with any instructions? Worked for me... Barely. Not sure I would even try with stainless lines. However, seemed better than paying over $100 for a tool I'm probably never going to use again. Rated 2 out of 5 by Fiskarelli from decent.. Works, but barely gives you a bead. I was expecting a bigger bead like you see on factory tubes but it does not. I would look else where if your looking to bead the end of a hard line.